It is 39.8 miles from the David O. McKay Events Center in Orem, Utah to the Energy Solutions Arena in Salt Lake City, Utah. For a fan, that journey takes 45 minutes (if you drive the speed limit). For a Utah Flash basketball player trying to work his way into the NBA, that journey can take most of a young lifetime. Just then, Orien trotted over to the ball rack, making me look really smart to my young guests — not an easy thing to do when it comes to teenagers. “How did you know he was going to do that?” my young friend asked. That’s not to say he thinks of nothing else. Orien has plans for real estate investing and a possible restaurant, but for right now, while he is young, Orien Greene’s life is basketball, and that’s probably a pretty smart game plan. Orien Greene has tasted success in basketball at many levels, including in high school, college, the NBA, and overseas. And now, as a member of the Utah Flash, Orien intends to taste it again in the NBA’s League of Dreams. Gainesville High School in Gainesville, Florida isn’t exactly known as a basketball powerhouse. In fact, their only state championship was in 1969. However, when Orien Greene played for GHS, they won TWO state championships (1999 and 2000). The Purple Hurricanes played full-court defense all game every game to fluster and wear down their opponents, and you can see that influence in Orien’s game even today. To put that feat in perspective, other Florida Mr. Basketball award winners include: Amare Stoudemire (2002), Vince Carter (1995), and Vernon Maxwell (1983). To me, even more remarkable than the fact that Orien Greene was named Mr. Basketball, is the fact that Orien never told me he’d won the award. During the course of our 21 minute interview, Orien talked only of the team successes he was a part of, and never mentioned any personal accolades. In fact, I would never have known about them had I not had the good fortune of bumping into Orien’s old college roomate: Brian Hamilton. Likewise, Orien didn’t mention that Gainesville High School has retired his jersey: number 5. Nor did he mention pretty much any of the other accomplishments I’m about to share with you; I had to do my homework to find them. 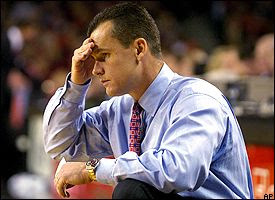 At any rate, while Orien Greene was at Gainesville High School busy winning his second state championship, Billy Donovan and his University of Florida (at Gainesville) Gators came very close to winning the 2000 NCAA National Basketball Championship. After defeating Butler, Illinois and Duke to reach the Final Four, Florida then beat North Carolina to reach the championship game. In the end, Florida fell to Michigan State (89-76). With a run like that, naturally Florida’s “Mr. Basketball” decided to attend his hometown school, the University of Florida. Orien was a significant contributor right away, averaging 19.1 minutes per game his freshman year, but his Florida Gators faltered at “the Big Dance” and were upset in the second round of the 2001 NCAA tournament. His sophomore year at Florida, Orien averaged 23.8 minutes per game, 5.2 points, 2.8 assists… and Orien’s average of 1.97 steals per game was the fourth best steal tally in the history of Gator basketball. Not bad considering Donovan played Greene out of position. Greene, a natural point guard, was usually played at the small forward position because of his size and defensive ability, Donovan giving the guard duties to upper class men. 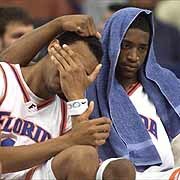 Unfortunately, Florida was once again upset and this time was ousted in the first round of the 2002 NCAA tournament. Despite playing every game for the University of Florida his freshman and sophomore years, including 30 starts as a sophomore, Orien Greene moved away from the town he played his entire high school and college career with, and transferred to the University of Louisiana at Lafayette. He told me he really needed the new start. In Orien’s absence, Billy Donovan’s Florida Gators continued to underachieve the next two years in the NCAA tournament, exiting in the first and second rounds at the hands of lower seeds. Meanwhile, Orien sat out the 2002-2003 season (an NCAA rule for transfer students), then Orien Greene and roommate (and now fellow Utah Flash teammate) Brian Hamilton helped the University of Louisiana at Lafayette achieve heights they had not seen in quite awhile, leading their school to back to back NCAA tournament appearances. Yes, that’s right. Despite Orien Greene’s transfer from basketball powerhouse Florida to a “mid major” school, Orien still went to the NCAA tournament all of his 4 years playing college basketball. His senior year at Louisiana-Lafayette, Greene injured his leg, and in his absence the team had just 6 wins and 7 losses. When Orien returned to the lineup, still not fully healed, the Ragin’ Cajuns went 14 – 3, and won their second consecutive Sunbelt Conference championship. Orien averaged 11.4 points per game his senior year, and 5 rebounds a game, which for a point guard is a very high rebounding average. Greene was also selected the Sunbelt Conference Defensive Player of the Year both years he played for Louisiana-Lafayette. In the 2005 NCAA tournament, the Ragin’ Cajuns came very close to upsetting Rick Patino’s Louisville Cardinals, who went on to make the Final Four. Orien Greene, one of several Ragin’ Cajuns in foul trouble, fouled out with 7 minutes left in the game. In Orien’s defense though, at least one NBA scout wrote of the game that Orien was called for “3 questionable offensive fouls.” Had Orien been able to stay on the floor, it is very likely Louisiana-Lafayette would have upset the Louisville Cardinals. By the way, the game was closer than its final score would lead you to believe. The Ragin’ Cajuns lost by 6 points, but they had to foul at the end of the game to stop the clock. Speaking of free throws, by game’s end Louisiana-Lafayette very much regretted missing 8 of theirs. Orien’s performance seemed to have caught the attention of the right people though. At 10:25 p.m. on Tuesday, June 28, the Boston Celtics selected Orien Greene as the 53rd pick of the 2005 NBA Draft. According in ESPN at that time, a second round draftee has about a 1 in 4 chance of making a team. Orien Greene not only made the grade with Boston, but found himself with a 3 year contract (the first year guaranteed) that was a bit better than the league minimum. As a rookie, Orien Greene played in 80 of 82 games for Boston, starting in 5 of those games, and averaging 15.4 minutes per game. The following YouTube clip shows one of my favorite Orien Greene rookie moments… blowing by (future hall of famer) Alan Iverson in his prime, and dunking on (future NBA All-Star) Andre Iguodala. By the end of his rookie year, Orien Greene ranked 4th in the NBA in steals per 48 minutes (2.95). Nevertheless, on June 30, 2006, Orien Greene was waived by the Boston Celtics as they acquired rookies guards Alan Ray and (future NBA All-Star) Rajon Rondo. I can only imagine what a shock and disappointment that must have been for a young player with 80 games played, 15.4 minutes per game and 5 starts. Orien appeared to have wasted no time licking his wounds, however. Less than 2 weeks later, on July 12, 2006, Orien was signed by the Indiana Pacers… only to break a finger and miss the first 7 games of the season. Orien ended up playing in just half of the games of the season, and playing half the minutes he played his rookie year, and was waived by the Pacers at the end of the season. Two months later, Orien landed another spot on an NBA roster. This time the Reggie Theus coached Sacramento Kings gave the defensive minded guard a try… and let him go after only 7 games. Thanks in part to injuries and in part to playing on 3 teams in 3 years, Orien’s numbers in the NBA declined each of his 3 seasons. That’s not to say that he didn’t have his moments in the NBA. Orien had two games with 6 assists, a game with 8 rebounds, and scored in double figures 4 games, with a high of 14 points. Without a job in the NBA, once again Orien Greene wasted no time feeling sorry for himself. In fact, just weeks after being waived by Sacramento, Greene was playing for the New Zealand Breakers in the Australian National Basketball League. Immediately after, Greene headed to Europe to play in Amsterdam in the Dutch Basketball Association. Although not there long, Orien helped his team reach the Finals, where his team won the league championship. It goes without saying that Orien Greene is good for the Utah Flash, but it should also be said that the Utah Flash seem to be good for Orien as well. As you might expect given his defensive history, Orien Greene leads the entire D-League in steals per game at 2.8. Primarily a defensive player, Orien was never really ever known to be a shooter. Greene’s shooting percentage in college was just 40%, and he shot 39% over the course of his NBA career. However, with the Utah Flash, Orien Greene is averaging a very respectable 48% from the floor. Similarly, Greene is shooting the 3-ball better than he did in college or the NBA, knocking down 39% of his shots from the arc. Looking at Orien’s game split statistics, it is evident that when Orien plays well, particularly when he shoots a high percentage, the Flash win. Orien Greene averages 15.5 points per game. Among guards in the D-League, he ranks #17 in both points per game and in shooting percentage. And among guards, Orien is 12th in the league in rebounds per game (4.8). But I haven’t seen too many guards that can defend like Orien can. It is interesting, but Orien is statistically a better defender on the road than at home. While Orien Greene is taking advantage of his D-League minutes and improving his game, it is likewise clear what areas he still needs to improve. Orien leads the entire D-League in fouls per game, is 2nd in the league in technical fouls, and is 2nd in the league in turnovers per game. The good news though, is that all three of these things are relatively easy to remedy, especially when compared to other aspects of basketball that he has improved this year, such as improving his shooting percentage. Of all the skills players work on (e.g shooting, rebounding, ball handling, etc. ), I think the most underrated skill in basketball by most players is decision making. At every level of basketball you find people of enormous athletic gifts, with finely honed skills, holding themselves back because of the decisions they make, both on and off the court. Gilbert Arenas, Stephon Marbury and perhaps Allen Iverson come to mind as prominent examples of what I am trying to say. On the other hand, there are players who may not have been blessed with the best athleticism, quickness or talent, but their excellent decision making has set them apart from the pack. John Stockton, Steve Nash and Jason Kidd come to mind as prominent examples of what I am trying to say. Consequently, I am impressed that Jason Kidd is and always has been one of Orien Greene’s favorite players. Like Jason Kidd, Orien contributes to the game in ways other than just scoring. I asked Orien where his defensive mindset came from, and he said that when he was very young he wasn’t getting the minutes he wanted. Rather than complain about it, Orien decided he had to find “his niche,” and that his niche was defense. By out working all other players on the defensive end of the court, Orien found his coaches didn’t just want him in the game more, they needed him on the floor. Also on the subject of decision making, I am very impressed by Orien’s response to setbacks. In every instance, when confronted with a major disappoint in his career, Orien has responded by quickly making the tough decision, and deciding to get right to work on it. That’s not to say Orien doesn’t have room for improvement when it comes to decision making, but I’d say Orien definitely understands its value and applies the skill of decision making to the game of basketball and the game of life. My young friend looks up to Orien Greene for how he plays, but I hope he (and others) read this and also look up to Orien for all he has been through in the pursuit of his dreams, and for how Orien has handled adversity. I know I do. Orem Utah, the home of the Utah Flash, is a mere 39.8 miles away from Salt Lake City, the home of the Utah Jazz. For fans, it is an easy thing to get in a car and drive that distance. But for Orien Greene and the League of Dreams, the journey to the NBA is an intensely personal and difficult journey littered with setbacks and fueled by self belief… that also happens to play out in full view of the public eye. And unlike the journey fans take to NBA arenas, cruise control is of no help. Thank you, Amanda. Unfortunately, it is still a draft and not finished. Hopefully you’ll see this comment and check back when I have it completed. A very good piece. I’m really enjoying lurking on this blog. Thanks! I didn’t know you knew about it. I need to post more frequently and write about the NBA more, but it’s hard finding time. I am living in Amsterdam (Holland, Europe)and he performed here great!He helped the team (with CC Harrison now playing in italy and Teddy Gipson and the best dutch players) to be champion. He is a very good defender and it is attractive to see him play. Arik Shivek (israelian coach, now coaching in belgium) ‘brought’him to amsterdam, after seeing in a NBA Summercamp. Anyway, thanks for the story en let me know how he is doing. It was great to hear from you. I’ve been to Amsterdam myself on business and am very impressed with the Netherlands. I wish I would have caught a game or two while I was over there now though. Again, thank you very much for your comments. you and other basketball fans are always welcome to see amsterdam and a game here. You can stay here for free no problem. Wow! Thanks, Richard. We have no plans at the current time, but I can see us wanting to do that someday so I’ll keep your email address just in case. dang, great thing you have here. top 10 post i have ever read by independent blogger. WISH U ALL THE BEST O. YOUNG BLOOD AS U ALWAYS SAID LOL. Nice article, brotha Tom. Loved watching him play in Gainesville. I wish I could have seen him play in Gainesville, but I’m glad I’ve got to seem him play in Orem. I went to college with Orien and were to both Gator athletes. He is probably one of the funniest people I have ever met. Great to hear from you, Erik. Orien is awfully cool, I agree. I was O’s academic advisor at Louisiana (and B-Ham’s, too!). He had a raw talent and on-court decision-making that you don’t see often, even in the NBA. He’s a good guy. Glad to see he’s still impressing the fans. Orien is an amazing player and so much fun to watch!!! I used to have season tickets to the Flash, and as we get closer and closer to a cancelled season, I find myself missing OG and B-Ham more and more. Thanks for the great article.